Labor Day Weekend.......the end of summer! That's what Labor Day weekend is supposed to signify, right? Growing up, we were always led to believe that Memorial Day was the beginning of the summer season and Labor Day was the end of the season. 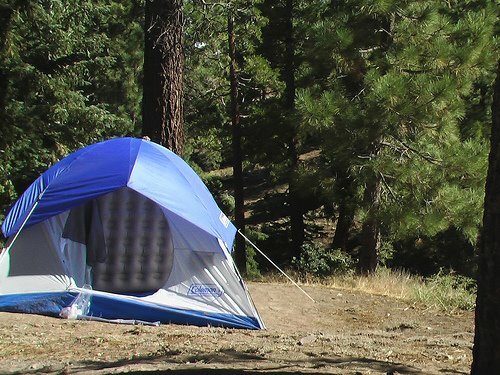 As a child, the first camping trip of the year was always Memorial Day weekend. Albeit, the last camping trip was......you guessed it, Labor Day weekend. This weekend, I won't be doing any camping, but one of my sons is bringing his tent and children and camping in my backyard. He has promised all summer that he would take them camping but his job requires that he be gone out of town frequently and for at least a week at a time, and with a wife and 3 young ones (9,3 and 8 months) at home, it has been almost impossible to get away on a camping trip. I hope we have good weather. I don't care if it's somewhat cool, but if we get rain and thunder and lightning, I know they'll all be sleeping in the house and they will be disappointed that they aren't camping out! Amber is coming for the weekend too, so it's a good thing that the tent is big enough for at least 4 people! My daughter, naive, wants to go up north to help mr. naive finish building the house he has been working on. She is anxious for him to get it finished, so he can come home and stay home, instead of just coming home for the weekend. I will keep Drew for her so she can go. Drew will NOT be sleeping in the tent! He will stay in the house with his Mema where it is nice and toasty and comfortable! That reminds me; I better stock up on hot dogs, and s'mores fixings cause we'll be having a "campfire" at night and it is impossible to have a camp fire without marshmallows!! I must be one of the luckiest women in the whole world. Why, you wonder? Because I am blest with some of the best children and grandchildren. Most of my children live fairly close by. The only one who lives far away is in Kentucky and we talk every week on the phone. Sometimes two or three times a week! My oldest daughter, Naive-No-More lives less than a mile away. She is a very smart lady! She is a mortgage loan originator/loan officer. She helped us get the financing for us to buy the house we live in now. She just helped us re-finance from an adjustable rate mortgage to a fixed rate at a decent percentage rate. She is awesome! 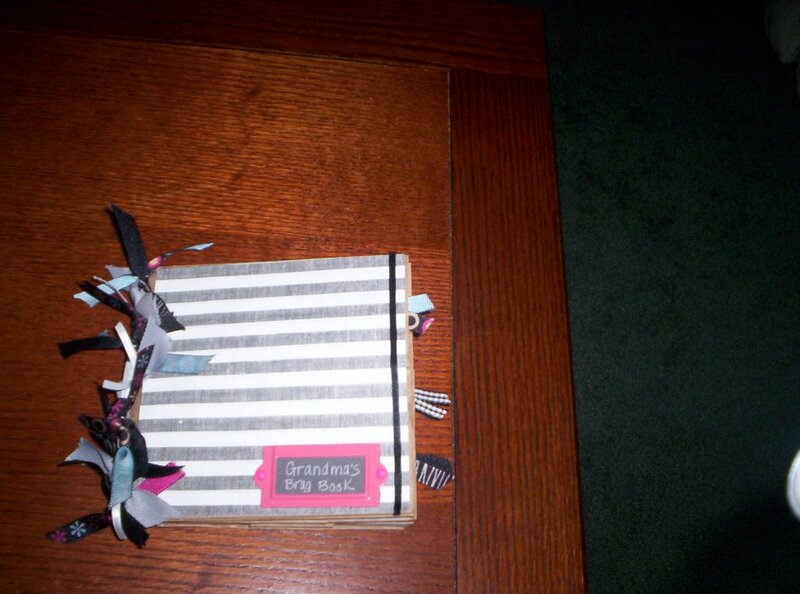 She also just made a "Grandma's Brag Book" for me. She is very talented and creative. It is made out of paper lunch bags and scrap book supplies! 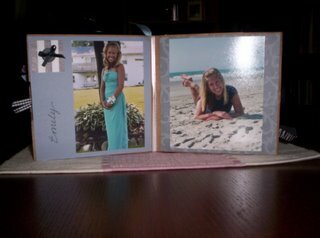 It contains pictures of her children, my grandchildren, Steve, Emily and Drew. Steve is a senior in high school this year, Emily a freshman, and of course Drew, who will be two in October. It is very hard to believe that she is old enough to have a child who will graduate from high school next May. Even harder to believe is the fact that I have a grandchild that old. 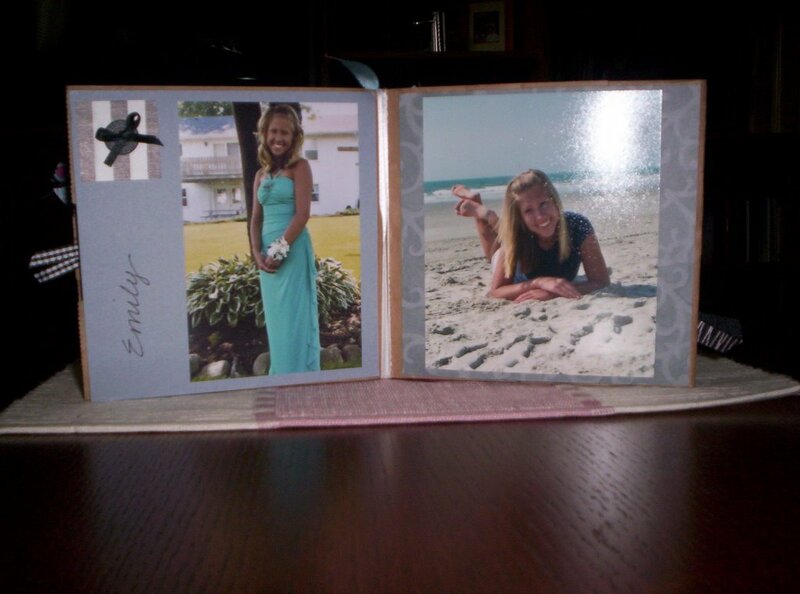 I took a picture of the brag book, but the picture doesn't do it justice. 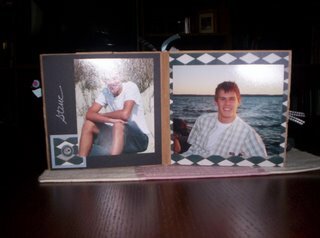 I have posted a few of the pictures contained in the album for all of you to enjoy too. Of course I think they are some of the nicest looking kids around! I spent the weekend at one of my son's home helping him care for his 3 children. His wife had to go out of town and he wasn't sure he could take care of all of them alone for a whole weekend. The oldest boy is 9, the next boy is 2 1/2 and the baby girl is 7 1/2 months. He has cared for them for a few hours at a time, but never the total care of all three for 2 days and nights. Panic set in and he asked for help. Of course I said "yes". This is probably only the 4th or 5th time in the last 9 years that he has asked for any kind of help and I couldn't have said "no" even if I had wanted to, which I didn't! Amber was going to spend the weekend with us, so she went along to play with her cousins. Every thing went well......up until about 1/2 hour before we were going to leave. Then Amber fell in the driveway. She lost her balance (something about getting her feet tangled in the hose) and fell backwards and caught herself with her left elbow. Oh my, the screaming was awful. I thought that the neighbors would call the police. It was loud and looooonnnnng! We finally got her calmed down enough to check it out and we decided we should wait until today to see if it was feeling better. It wasn't! But we tried everything to try to entice her to use it normally. Going for a bike ride with Bumpa, usually a favorite activity. Playing video games is another big hit, but not today. So finally this evening, after listening to her complain off an on all day, I decided to call her mom and take her into the hospital emergency room. That was about 8:30 PM. It is now Monday morning at 12:50 AM, and we just got back. The doctor said he didn't see any fracture on the x-ray, but perhaps the radiologist would see something, and sent us on our way with instructions to ice it and give ibuprofen every 4 hours as needed for pain. If the radiologists sees something, the doctor said they will call and have us come back for casting of her arm. It is the humorous bone in her left arm and when the doctor told her which bone of hers hurts, she told him that she didn't think there was any humor in the whole situation. Eleven going on 19, with an attitude to match any full blown PMS teen-age girl!! I gotta go put her in bed before she gets even more of an attitude from being tired! Mornings and I could be better friends.....if morning just started later in the day! Yesterday, I didn't have the best start to the day. When I got up, I opened the overhead garage door to let my four-legged, fur-covered child out to go potty. I noticed something laying on the garage floor and upon closer inspection found 4 baby mice with fur, but eyes still closed scattered around one stall of the garage. The only thing that could be done was to find a pair of shoes and a receptacle to pick them up with. If I left them there, the dog would either eat them or try to play with them, which would end up killing them in the garage. YUCK!! I haven't even had my coffee yet, I thought! This is not how I wanted to start my day. 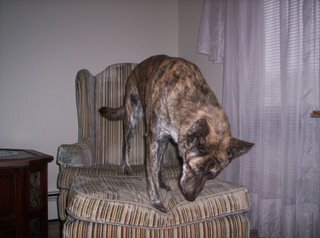 I must put the dog back in the house so she doesn't try to chase the mice after I release them. I find a dustpan and gently slide it under each baby mouse and walk down the bank through the backyard to the edge of our property and toss the mice into the adjacent empty lot full of deep weeds and brush. Upon returning to the house I feel the need to wash my hands, even though I never touched any of the mice. I pour myself my first cup of coffee for the day and decide I need to go potty too. 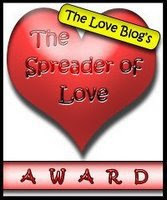 I rewash my hands and sit down at the computer to enjoy my coffee and visit blogs. But I hear a strange noise in the entry way. I investigate and discover that the dog has thrown up three times in the entry way. Freaking great! I WANT to drink my coffee! So now I have to clean up the dog puke and clean the carpet. Wash hands AGAIN!! Wonderful, my coffee is now cold. I pour it down the sink and pour a fresh cup from the coffee maker. Finally I get to drink my first cup of coffee. Within a few minutes the phone rings. It is the Betty Ford Breast Center reminding me that I have an appointment Thursday morning at 8:45 for my annual mammogram. Sweet! I love going there and having my "mammies mashed!" Two bad mornings in a row. Not much to look forward too, huh? Anyone want to go in my place? While in a deep discussion with a friend, the above quote came back to me. I can't remember where I heard it originally, but it sure does say a lot. I had to say some things that she found most unpleasant even though she needed to hear them. I needed to sit and really listen to what she was saying too. To sit and listen not only takes courage, it takes a LOT of willpower! I don't know if our conversation (which I cannot reveal here) will help her make any of her decisions, but at least it cleared the air.....and that is a good thing! 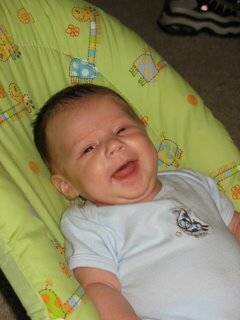 Also, wondering about my stillborn grandson, Owen. We never got a chance to know him; to watch him grow; to enjoy him and who he would be today! Ty at 2 months and Trenten with cast! He broke 3 bones in his foot but is expected to make a complete and full recovery. That's the good thing about being young......you heal very quickly! We don't know how long the cast will have to remain on his foot until he goes to the specialist Thursday. Hopefully it will be off by the time school starts in September!! Meet my newest grandson, Ty Christopher. He was born May 29, 2006. This is him just the other day...he now weighs over 11 pounds. Not a whopper by a long shot, but a "keeper" for sure. His big brother thinks he is pretty neat right now. Of course, that's because all he does is sit in one place unless someone else moves him. He isn't getting into any of Trenten's "stuff" yet, nor does Trenten have to share any of his toys at this stage in the game. I figure in about 6-7 more months when this little guy is crawling around and touching things that belong to Trenten they will be having some major battles in their household! 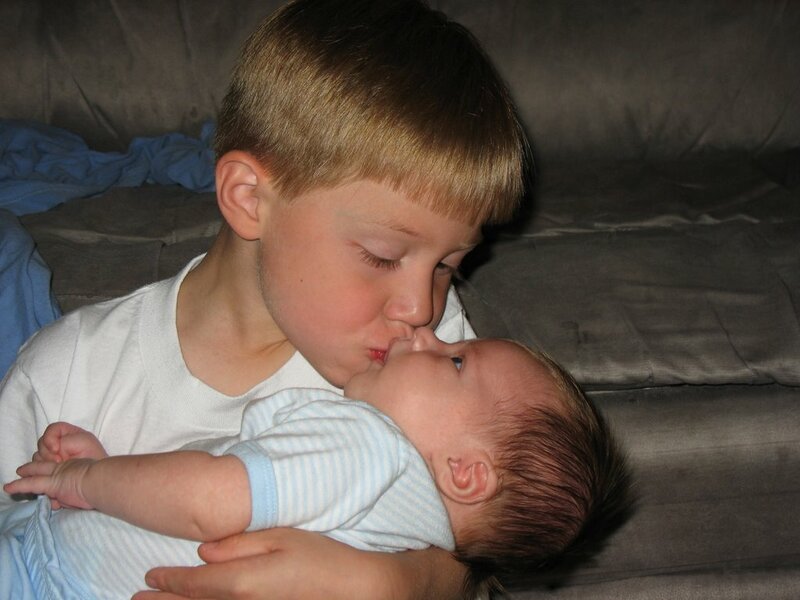 This picture is an example of how much Trent does love his baby brother......now. This is the little guy I got to spend my night with last Friday while they took his big brother, Trenten, to the ER for xrays of his left foot. 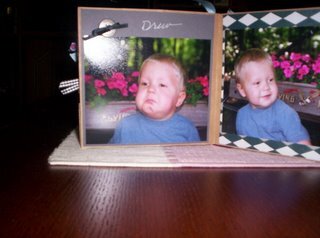 This picture of Drew was taken at my house this past week. 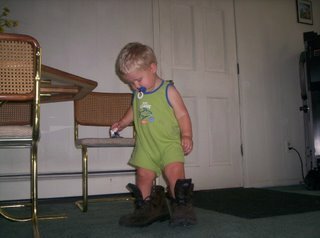 He is 21 months old and thinks he is quite grown up wearing "Bumpa's" workboots! Isn't he adorable? His folks got home around 8:45 last night. Drew and I were waiting for them at their house and Drew had his bath and was ready for bed in his pj's just waiting to see them before going "nite-nite"! I came home around 9:00 PM. At about 9:15 my phone rang and it was my daughter-in-law. 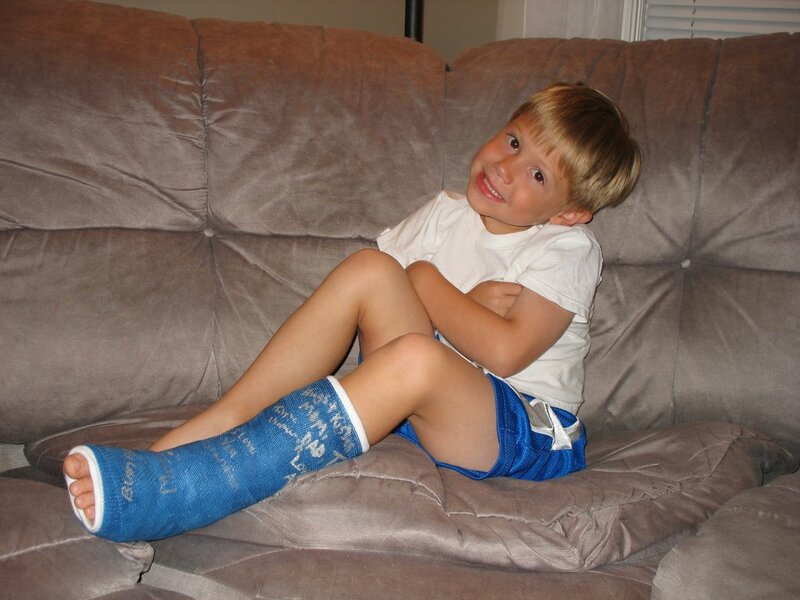 Their oldest little boy, Trenten (age 5) thought he could do a cannonball unto the living room floor. OOPS!! This required a trip to the ER and my services were needed to watch Ty (2 months old). I was there until approximately 1:30 AM when they returned home with a very tired little boy who was sporting a pretty blue fiberglass cast on his left leg. He broke 3 bones in his foot. Lesson learned: a cannonball should only be performed while jumping into a deep enough body of water! When hubby gets out of work today, we will go over to his house to see him and take him a small gift.....something to help keep him occupied while he recovers somewhat, and sign his cast. I will take pictures then and post them next time. "An American is English, or French, or Italian, Irish, German, Spanish, Polish, Russian or Greek. An American may also be Canadian, Mexican, African, Indian, Chinese, Japanese, Korean, Australian, Iranian, Asian, or Arab, or Pakistani or Afghan.An American may also be a Comanche, Cherokee, Osage, Blackfoot, Navaho, Apache, Seminole or one of the many other tribes known as native Americans.An American is Christian, or he could be Jewish, or Buddhist, or Muslim.In fact, there are more Muslims in America than in Afghanistan. The only difference is that in America they are free to worship as each of them chooses.An American is also free to believe in no religion. For that he will answer only to God, not to the government, or to armed thugs claiming to speak for the government and for God.An American lives in the most prosperous land in the history of the world.The root of that prosperity can be found in the Declaration of Independence, which recognizes the God given right of each person to the pursuit of happiness.An American is generous. Americans have helped out just about every other nation in the world in their time of need, never asking a thing in return.When Afghanistan was over-run by the Soviet army 20 years ago, Americans came with arms and supplies to enable the people to win back their country!As of the morning of September 11, Americans had given more than any other nation to the poor in Afghanistan. Americans welcome the best of everything...the best products, the best books, the best music, the best food, the best services. But they also welcome the least.The national symbol of America, The Statue of Liberty , welcomes your tired and your poor, the wretched refuse of your teeming shores, the homeless, tempest tossed. These in fact are the people who built America.Some of them were working in the Twin Towers the morning of September 11, 2001 earning a better life for their families. It's been told that the World Trade Center victims were from at least 30 different countries, cultures, and first languages, including those that aided and abetted the terrorists.<>So you can try to kill an American if you must. Hitler did. So did General Tojo, and Stalin, and Mao Tse-Tung, and other blood-thirsty tyrants in the world. But, in doing so you would just be killing yourself. Because Americans are not a particular people from a particular place. They are the embodiment of the human spirit of freedom. Everyone who holds to that spirit, everywhere, is an American."